Position the surround sound speakers in your home theater the right way to add a third dimension to your audio. Properly placed surround sound speakers (sometimes called rear speakers) maximize the home theater experience. Many receivers label the surround outputs as Rear, so people imagine that these speakers need to be along the back wall, behind the listening position. This isn’t always the case — particularly with the bipole or dipole surround speakers, which are the most common kinds. The position of these speakers may vary depending on the sound system you are using. For 5.1-channel surround sound, place bipole or dipole surround speakers along the side walls (preferably mounted on the side wall). Position the speakers even with or slightly behind your home theater seating, and about 2 feet above the listeners’ seated ear level. If using direct-radiating speakers for your surrounds, the best placement is behind the listeners, aimed so that they radiate (face, in other words) toward the back wall. That might sound a bit counterintuitive, but if you face them directly toward the listening position, you don’t get the diffuse surround sound that you’re looking for. 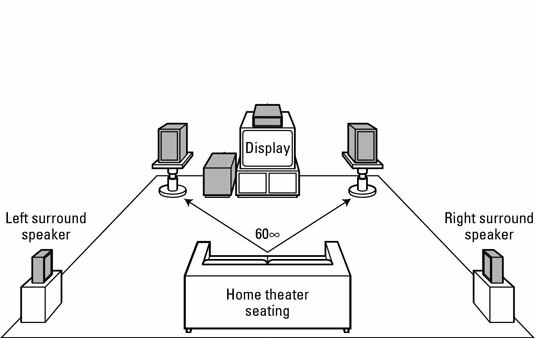 If your room layout supports it, place your surround speakers on either side of your primary viewing/listening position so that they are each within a 90- to 110-degree angle from your head — where straight ahead (looking at the screen) is 0 degrees. Note the placement of surround speakers in a 5.1 channel surround-sound speaker configuration. If you’re using Dolby Digital EX or DTS ES, you have an extra speaker (or two) to deal with. These systems have side surrounds (which are placed like 5.1-channel side surrounds) and center-surround channel speakers (one or two, depending on whether you’re using a 6.1- or 7.1-channel setup). These center surround speakers should be placed behind the listener. In a 6.1-channel setup, they go directly behind the listening position. In a 7.1-channel system, the two center surround speakers should be placed along the rear wall, on either side of the seating position. In a 7.1 system, you should put each of the rear surrounds at an angle of 130 to 150 degrees from your main listening position — again relative to your display being 0 degrees.